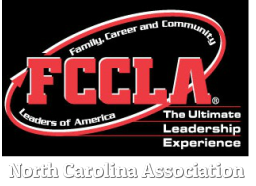 North Carolina Family, Career and Community Leaders of America (FCCLA) has more than 3,150 resources – its members! Family and Consumer Sciences education prepares youth with employability skills and rich experiences critical for success. As the only Career and Technical Student Organization with family as the central focus, FCCLA develops skills that last a lifetime from creative and critical thinking to practical knowledge and career preparation. A variety of opportunities are available to suit every organization’s goals and budget. market to Future North Carolina Families! Through the financial and professional support of a wide variety of organizations, associations, universities, and corporations FCCLA is able to continue its tradition of providing personal growth and leadership opportunities to youth. If you would like to become a part of this initiative please contact the NC FCCLA Adviser Janet Johnson.